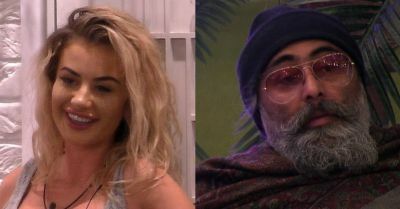 Two housemates are nominated in a vote to save - Chloe and Hardeep. The eviction show starts 9:15 PM on Tuesday. Here are the voting numbers to save. Chloe voted for Nick and Hardeep. Dan voted for Chloe and Ryan. Gabby voted for Hardeep and Roxanne. Hardeep voted for Chloe and Roxanne. Jermaine voted for Nick and Hardeep. Kirstie voted for Hardeep and Chloe. Nick voted for Roxanne and Chloe. Roxanne voted for Hardeep and Ryan. Ryan voted for Chloe and Roxanne. Sally voted for Hardeep and Chloe. I find Chloe is super boring so I picked Hardeep. Hardeep brings more to the table as a HM. Yes, there are things about his character I don't find so appealing but I think he is basically a decent enough guy- an example being his support of Dan tonight. Chloe, however, has zero personality, is all about herself and has questionable morals. I don't usually vote, but I will this time as the Chloe/Jermaine/Roxanne/Ben combination and their irritating behaviour is totally repulsive to me and is doing my head in! Plus Hardeep is causing the most friction.